In 2012 tattoo artist Josh Hall commissioned Starr for branding, sign painting and gilded glass for J. Hall & Co. Gentleman Tattooers located on South Lamar in Dallas. The project has evolved over the years with new artwork being added each year to the exterior and interior. 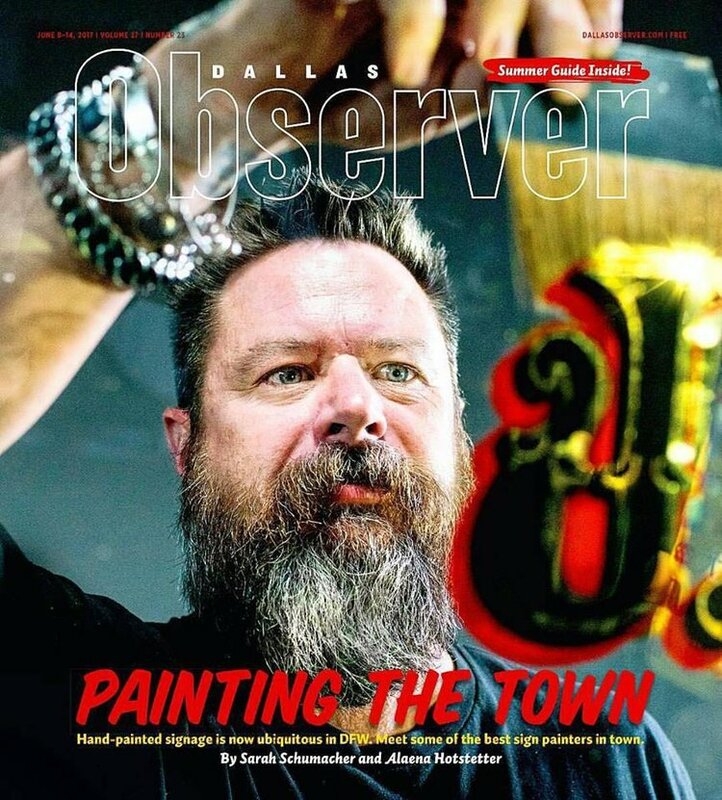 Photos by Daniel Driensky and Sarah Reyes for the Dallas Observer. In 2017 Starr was commissioned to create classic styled 23k gilded glass throughout the Gordy & Sons Outfitters showroom in Houston, Texas. The project included hand drawn acanthus leaf border details, custom designed monograms and a large scale, genuine silver leaf and 23k antiqued verre eglomise mirror installed in the showroom elevator. n 2011 Starr was commissioned by GAP Jeans to hand paint 3 taco trucks that were launched in Los Angeles, San Francisco and Chicago. The trucks were teamed with celebrity chefs to celebrate the 1969 collection. In addition, Starr was commissioned to execute multiple in store graphics at several Gap store locations in the Los Angeles area. In 2014 Starr was commissioned by the Andrews Family of Fort Worth to create dozens of large scale art installations at the Paul & Chris Andrews Car Museum in Fort Worth. Starr's work graces the cover of the band The Toadies album Heretics which was released on September 18, 2015. The design was also incorporated into several pieces of apparel including t-shirts and belt buckles. The piece was commissioned by the band for the front cover art and executed on glass and features verre eglomise reverse glass gilding. In July of 2015 Starr was commissioned by Indian Motorcycles to design and execute the paintwork on a 2015 Indian Scout motorcycle to pay tribute to Indian's history in hillclimb motorcycle racing. The bike was built by Indianmotorcycles.net and made its debut at the 75th Anniversary Sturgis Motorcycle Rally in Sturgis, South Dakota on August 3, 2015 with an attendance that exceeded 1,000,000. In September 2015 artist's Sean and Kayleigh Starr were invited to Limerick, Ireland by the the City of Limerick to attend the annual Elemental Arts Festival and to create a massive ghost sign project, designed by Sean Starr in cooperation with the band The Cranberries.